In memory of the death of Coretta Scott King, the wife of Martin Luther King Jr, here’s a little piece I wrote in 1998, which never got published to my knowledge until now. Hope it makes sense. Since I wrote it there was a civil court case in Memphis which cleared James Earl Ray of the killing of Martin Luther King. However, the ‘limited investigation’ by Janet Reno confirmed Ray as the assassin. When I first went to Memphis in January 1990 I travelled from Atlanta, the city where Dr Martin Luther King was born, with the idea of doing a bit of sightseeing. The ‘Home of the Blues’ around Beale Street, where musicians like BB King had made their name, was my first stop. Like every other tourist I also went to the home of the city’s favourite son, Elvis, though for some reason decided I didn’t fancy going into Graceland. Before leaving Memphis I went with my girlfriend Kate, an archaeologist, in search of the place where King was killed. After a little investigation we found the Lorraine Motel where the civil rights leader was killed, except it looked more like a building site than a motel, ringed by a high steel fence. There was no one in sight apart from a black woman sitting under a blue plastic tarpaulin. Her name was Jacqueline Smith, and I soon found out she’d already been living there for nearly two years in protest at the plans to turn the old motel into a hi-tech museum. In 1968 Jacqueline Smith was a student at North Memphis’ Douglass High School, a member of the student council, contemplating a career as an opera singer. After graduation the following year her passion for singing began to wane. “She turned down a voice scholarship to the University of Southern Mississippi, sang briefly in Chicago, attended State Tech, and worked at Sears Crosstown before landing work as a maid and desk clerk at the Lorraine Motel, a job that also provided free boarding.”(1) Around the same time Jacqueline joined the staff of the black-owned motel in the late 1970s, a handful of city notables discussed the possibility of turning it into a King Memorial (though this was blocked by the Martin Luther King Center for Nonviolent Social Change in Atlanta), or a Civil Rights Hall of Fame. This dream became a step closer to reality when in 1980 Shelby County Commissioner Jesse Turner, asked the County Board of Commissioners to purchase the property to save it for the community. By 1983 a group called the Lorraine Civil Rights Museum Foundation, led by circuit court judge D’Army Bailey, decided to turn it into a museum commemorating all civil righters, not just Dr Martin Luther King. This decision was a crucial point in the evolution of the museum plans. Veteran civil rights activist Cornelia Crenshaw, a close friend of Jacqueline’s, organised a series of protest meetings where the common feeling was that the site should be “King only”. It was felt strongly that this was sacred ground, the importance of which should not be diluted by turning it into an all encompassing civil rights museum. “Foundation members, however, did not see it that way. Their vision did not extend toward King’s goal of aiding humanity. They were instead distracted by the spotlight and the chance for quick glory.” (2) To understand why you need to see the development as part of the larger gentrification of the area, such as the re-modelling of Beale Street to attract tourist dollars. As part of this move many properties in and around Mullberry Street were in 1986 placed on the State Register of Historical Places, providing state subsidies to developers. However, when Cornelia Crenshaw and other senior residents tried to get some of the money to renovate their decaying homes in adjacent Vance Avenue, they were refused any funds and Vance Avenue was taken off the State Register of Historical Places. On 12 January 1988, the State of Tennessee ordered the Lorraine Motel closed. Jacqueline managed to stay put until Memphis police officers dragged her from the motel, dumping her and her belongings on the sidewalk on 2 March. She spent that first night covered with a quilt and a piece of plastic to keep the rain off. She was still under that piece of plastic when I met her at sidewalk home. Her argument was that the site should be used for the homeless or as a community centre in the spirit of King’s life and philosophy, not turned into a National Civil Rights Museum at the cost of $9.2m. Then she gave me a copy of an article titled ‘I Had a Dream’, in which she said: “I don’t feel that now is the time to be bearing testimonies or putting up museums to civil rights at the Lorraine Motel. It tends to give the impression that everything is alright and that we have overcome. Nothing is further from the truth. We are not alright and we are not OK, and we have not overcome.” She also told me that the plan for the museum included a laser sculpture to show the path of the assassin’s bullet through King’s heart. I promised to try and do something when I returned to England. Mercifully when the National Civil Rights Museum finally opened in August 1991 the laser exhibit idea had disappeared. So too had the opposition of the King family; despite her ambivalent attitude to the museum Coretta Scott King, attended on 2 July 1991 as a part of a week long series of dedication events, in return for an a speakers fee of $15,000. It was also reported that Graceland officials had offered to donate their expertise in merchandising and trade mark protection to the museum and the King Center. (6) It appeared that Jacqueline’s protest had been in vain. I lost touch with her and got on with the business of becoming a journalist. He explained that many people did not want to be seen as knocking it because the museum was seen as a rare example of a black run and owned institution. He added: “While much of the black community ignores what’s going on here the grassroots black community in Memphis understand Jacqueline Smith’s protest and congratulate her for hanging on in there.” Despite black middle class support for the museum, Jacqueline’s eight year protest was having an effect where it hurt most – attendance money. The target of 150,000 visitors a year was in reality never more than 100,000. (8) In December 1996 the museum’s executive director Juanita Moore resigned, admitting that the museum attendance had been hurt by Jacqueline’s protest. On 2 March 1998 Jacqueline marked the tenth year of her sidewalk protest. In a letter to me she explained the source of her remarkable determination. “I believe with all my heart and soul that the Lorraine Motel should be put to better use, to practice the principles of Dr King. I plan to continue to fight the wrong here until the day I die.” Four weeks later I returned to Memphis to help cover the 30th anniversary of Dr Martin Luther King’s death for the BBC with US affairs analyst Maurice Walsh and to meet Jacqueline once more. On 4 April, as the TV crews were getting ready to broadcast the anniversary, Jacqueline shared her lunch with me. It was an odd feeling, sitting there, tucking into my chicken and rice, looking at the satellite dishes and the museum, catching sight of the balcony where King was killed and waiting for the appointed hour. Jacqueline posed for a photograph with me, and then got back to the business of talking to tourists with ‘Fulfill the Dream, Help Others’ on a banner behind her. At 6.01pm I took one more photograph, and left. James Earl Ray died in prison on 23 April 1998. Following pressure from the King family on 26 August attorney general Janet Reno announced a ‘limited investigation’ into the death of Dr Martin Luther King. Heading the current investigation is Barry Kowalski, whose work has included prosecuting the Rodney King case in Los Angeles. And in 2014 – Jacqueline Smith is still protesting – Washington Post piece. (1) ‘April 4, 1968’, Mark Jordan, The Memphis Flyer, April 2-8, 1998. (2) ‘Jacqueline Smith’s Story’, William Larsha. (3) ‘I Had a Dream’, Robert Gordan, Spin, April 1989. 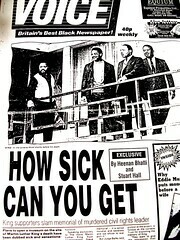 (4) ‘How Sick Can You Get’, Heenan Bhatti and Stuart Hall, The Voice, 2 October 1990. (5) ‘The Glory and the Glitz’, Walter Shapiro, Time, 5 August 1991. (6) ‘Museum Speakers Received Payment’, Wayne Risher, The Commercial Appeal, 10 July 1991. (7) ‘King’s Son In Museum Row’, Stuart Hall, The Voice, 6 January 1997. (8) ‘Civil rights museum exec Moore quits’, Jody Callahan, The Commercial Appeal, 11 December 1996. (9) ‘Battle Flares on the King Legacy, Just as Lucrative as It Is Lasting’, Kevin Sack, The New York Times, 15 January 1997. This entry was posted in History, History-Martin Luther King, Main Page by Stuart G. Hall. Bookmark the permalink. I live less than 2 few blocks away from the site. She’s still there, if it is indeed the same person. She’ll be up to 20 years in March, if your times are accurate. Frankly, I don’t like her. She’s gotten to be more annoying in recent years, putting up signs about gentrification and such in the area during block parties and festivals. The South Main district has become a rather nice neighborhood now, with people of all races living there. Having somebody like her continually stirring the pot of racial hatred doesn’t help anything. In my opinion, people like her only serve to continually divide people by color. The rest of us got over it and don’t care what race somebody is. Now, it’s people like Jacqueline that have become the problem. The rest of the world moved on past people like her, and IMO that’s a good thing. The FBI, under written directive from then Attorney General Robert F. Kennedy, began wiretapping King in 1961. J.Edgar Hoover feared that Communists were trying to infiltrate the Civil Rights Movement, but when no such evidence emerged, the bureau used the incidental details caught on tape over six years in attempts to force King out of the preeminent leadership position.